The aim of the project is to examine Construction Grammar (CxG) from a multilingual perspective. It is methodically linked to the project “Widespread Idioms in Europe and Beyond” and tries to identify those construction patterns which are spread across a number of languages. The data will be collected by surveys in collaboration with competent native speakers. Pre-tests are used to limit the number of possible widespread structures. Particular emphasis is put on the fact that the participants provide suitable contexts for the structural patterns to ensure the equality of the form-meaning pairs of constructions of different languages (for the questionnaires see below). CxG has almost exclusively been the topic of research on one single language at a time. However, as evidenced by initial investigations, lexically unspecified constructions can be spread across a large number of languages in the same or very similar semantic-syntactic structure. A particularly relevant class is the so-called constructional phrasemes. The constructions themselves are characterized by a lexical meaning. Only certain positions in their lexical structure are filled; other positions represent slots that must be satisfied. I would like to introduce the concept of widespread constructional phrasemes which are hitherto unknown in the realm of theoretical and empirical CxG research. Correspondences of the English construction the simplest/ best/ most natural/ most normal/ ... thing in the world are reported for 20 standard European languages so far, among them Finno-Ugric languages, Turkish and Basque. I restrict myself to examples meaning literally “the simplest/easiest thing in/of the world”. German die einfachste Sache der Welt, Dutch het eenvoudigste ding ter wereld, Swedish världens lättaste sak, French la chose la plus facile du monde, Italian la cosa più semplice del mondo, Spanish la cosa más facil del mundo, Romanian lucrul cel mai simplu din lume, Latvian visvienkāršākā lieta pasaulē, Belorussian самая простая рэч на свеце, Polish najprostsza rzeczą na świecie, Czech ta nejjednodušší věc na světě, Slowak je najjednoduchšia vec na svete, Croatian najlakša stvar na svijetu, Macedonian наједноставната работа на светот, Albanian gjë e lehtë/thjeshtë në botë, Greek το πιο απλό πράγμα στον κόσμο, Hungarian a legegyszerűbb dolog a világon, Finnish maailman helpoin asia, Estonian lihtsaim asi maailmas, Turkish dünyanin en basit şeyi, Basque munduko gauzarik errazena, etc. The pattern has the superlative of an adjective as an open slot, while the lexical-syntactic template correlates with the intensification of the meaning of the adjective, ‘very, particularly’. Due to the typology of the languages in question, the formalization of the pattern [the adjsuperlative thing in the world] (as for English) may result in different sub-formalizations such as [the world’s adjsuperlative thing] (Swedish, Finnish), [the thing the most adj of the world] (French), [the most adj of the world] (Spanish), and so on. The question whether these “similar” constructions can be subsumed under one generalizing model concerns the degree of abstractness in the formalization.Due to the typology of the languages in question, the formalization of the pattern [the adjsuperlative thing in the world] (as for English) may result in different sub-formalizations such as [the world’s adjsuperlative thing] (Swedish, Finnish), [the thing the most adj of the world] (French), [the most adj of the world] (Spanish), and so on. The question whether these “similar” constructions can be subsumed under one generalizing model concerns the degree of abstractness in the formalization. A subset of common construction patterns has long been known to researchers. These are idioms which share a similar syntactic structure and figurative core meaning, but differ lexically. I suggest the term widespread idiomatic patterns for this category. These patterns are examined only marginally in the project. There are some exceptions, e.g. J. van Pottelberge’s (2004) Der am-Progressiv. Struktur und parallele Entwicklung in den kontinentalwestgermanischen Sprachen, Tübingen, and J. Bücker’s (2012) Sprachhandeln und Sprachwissen. Grammatische Konstruktionen im Spannungsfeld von Interaktion und Kognition, Berlin/Boston, where the author adds parallels in 12 European languages to a German construction. Other multilingual approaches come from language contacts and borrowability; cf. St. Höder (2012): Multilingual constructions: A diasystematic approach to common structures. In: K. Braunmüller; A. Gabriel (eds. ): Multilingual Individuals and Multilingual Societies. Amsterdam/ Philadelphia, 241–257 and A. S. Doğruöz (2016): On the borrowability of subject pronoun constructions in Turkish-Dutch contact. In: M. Hilpert; J.-O. Östman (eds. ): Constructions across Grammars. Amsterdam/Philadelphia, 7–33. 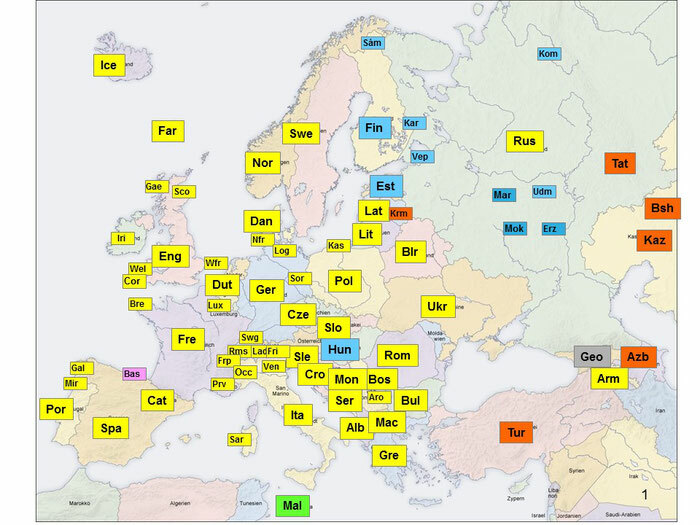 Research on phraseology, with a focus on formulaic and figurative language, extends for the most part to a few standard European languages with a rich literary tradition. Lesser-used, mainly unwritten languages and dialects have only rarely been included in the research spectrum so far. However, there is a number of publications on the stereotyped nature of languages of distant cultures and continents, including indigenous varieties which primarily exist in oral form. These studies have been carried out mainly in the framework of anthropology and ethnology, usually treating metaphors and proverbial units along with rites, spells, incantations, myths, moral stories, etc. They therefore met with the interest of paremiology but hardly have been noticed by the traditional phraseology research – although they have the same linguistic elements as the object of their research. The first part of the project consists of a detailed inventory. Wolfgang Mieder’s bibliography (2009) and the annual references in Proverbium (2010–2017) provide the basis that will be expanded and elaborated into an annotated bibliography. The second part arranges these studies according to subcontinents. Individual regions such as Papua New Guinea are particularly well represented in the project. There is also a large number of publications on lesser-used languages of Africa and the Americas. Europe will be represented with Basque and Inari Saami as well as Sorbian, Kashubian and some dialects. The third part asks whether these studies may contribute to our knowledge of formulaic and figurative language in general and probably enrich the theoretical insights which have been gained so far by a few major standard languages. The focus will be on conceptual metaphors, conceptualizations, and pragmatic functions of figurative units which seem to diverge from those examined in the literary languages. Examples concerning conceptual metaphors come from Inari Saami, a declining language at the edge of Northern Europe: it does not know metaphors like time is money but uses its own metaphoric models, such as time is nature. Examples of body part conceptualizations come from Kilivila, an aboriginal Austronesian language spoken in the Trobriand Islands (Papua new Guinea). Cultural anthropologist Bronisław Malinowski (“Argonauts of the Western Pacific”, 1922) collected a large number of figurative units. He showed that in Kilivila ‘intellectual activities’ are located in the larynx or belly respectively and these conceptualizations are fundamentally different from what was later written about European somatisms. Pragmatic functions of figurative units which have no parallels in Western cultures are manifold. Studies on lesser-used languages of the East Asia-Pacific region have demonstrated the disguising potential of entire figurative speech systems. These “secret languages” are used to veil tabooed concepts; only insiders know the code. Another function which, from a European perspective, seems to be uncommon is the use of proverbs as a part of legal process, as a method of gaining favor in court, as it is reported from several African speech communities. These functions of figurative units differ significantly from those known in societies with literary traditions. Further studies on languages of preliterate communities are urgently needed to get an overall picture of the appearances of figrative units and formulae. The project is largely completed, but there may be some additions. Here are the main points in a nutshell. ► The aim of the project was a systematic investigation into idioms that exist in many European languages in a similar lexical and semantic structure. ► I built up a network of 300 competent respondents who filled in a wealth of questionnaires. 78 European and 20 non-European languages took part in the project. ► About 500 widespread idioms were identified so far. The results were completely unpredictable. ► I examined these idioms in their cultural context to clarify their origin. ► The results of the project are published in the two volumes “Lexicon of Common Figurative Units” (Piirainen 2012 and 2016). ‘to go against prevailing opinion or thought; to think or act contrary to the views of the majority at the time’ (as if the person was swimming against the current of a river or the like). 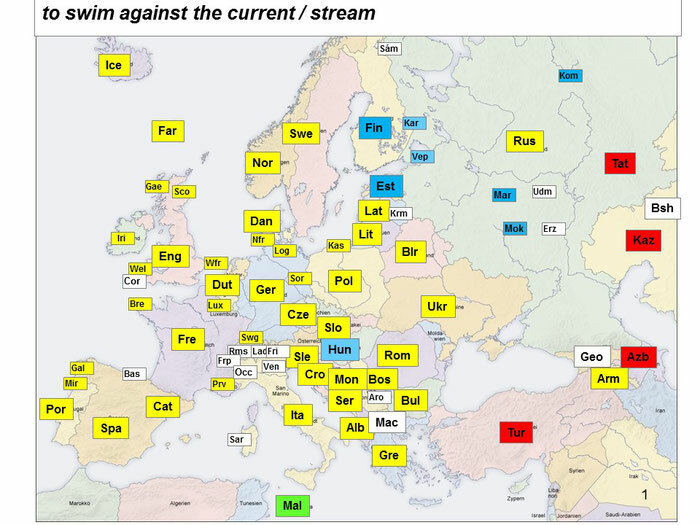 The respondents reported that equivalents of the idiom exist in 58 European and several non-European languages.